I decided to make an almond-infused Philly-style ice cream to pair up with my apricot frozen yogurt, since apricots and almonds have a special affinity—the edible kernels inside the pits of apricots have an almond-like flavor. The method is a simple one and could be used with any type of nut; in fact, it is an adaptation of the gianduja gelato I made a few years back. (That long, really? I need to remedy that, and pronto!) Along with the toasted almonds, dairy, and sugar, I opted to flavor the base with some orange rind, vanilla and almond extracts, and a healthy drizzle of local honey for a subtly fragrant dessert that we couldn’t get enough of. 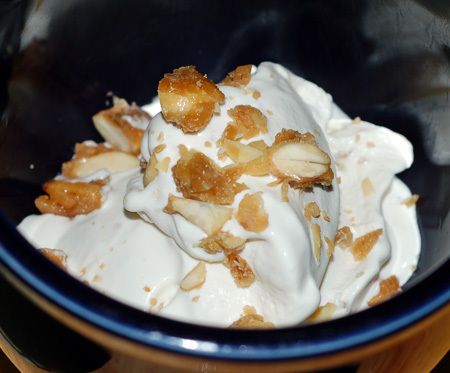 To add some needed crunch to the ice cream, I also made up a quick batch of gingered almonds, combining blanched almonds with butter, sugar, and powdered ginger in a skillet until the sugar caramelized and the almonds toasted. These are spicy-sweet, highly addictive snacks all on their own—you may even want to double the batch so as not to eat all the nuts before they make it into the ice cream. I should note that I blanched the almonds myself. I always buy whole raw nuts in bulk because they store better, and I can always roast, chop, salt, candy, pulverize and etc. as many as I need at any given time. However, the skins of raw nuts need dealing with in some way; they contain antioxidants, but also enzyme inhibitors that can interfere with digestion. 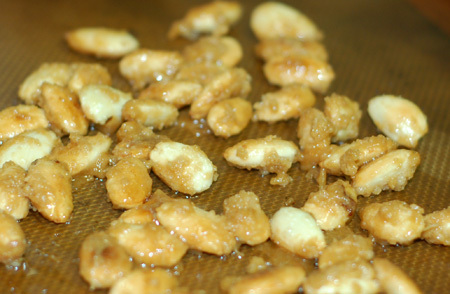 Usually, I just roast my nuts whole, but I understand you can also soak them in warm saltwater; the other option is to blanch them and remove the skins entirely, which has aesthetic benefits if you don’t want the dark flecks in your food. Personally, I’ve shied away from skinning nuts in the wake of the hazelnut incident, but let the record show that my recent experience with blanching almonds was nothing like that, and I will no longer avoid doing it when necessary. Almonds just need a 60-second dip in boiling water followed by a thorough rinse under cold water, and they slip right out of their skins without a fight. As a bonus, I made a second batch of candied almonds to top a salad last night, spicing them up with the ginger, plus 1/4 tsp smoked paprika and a whisper of cayenne pepper (my fresh stuff from Penzey’s is so much stronger than the red sawdust I threw out that I almost can’t use it); after pouring the nuts onto the silpat to cool, I sprinkled them generously with kosher salt. They were deliciously sweet, salty and crunchy, with a little kick of heat that rolled in after the fact. Nolan and I ate about a quarter of them by the time dinner was ready, and I chopped up a big handful to serve over a simple salad of mixed greens and a creamy, sweet and tangy yogurt-balsamic dressing. This was the first salad I’ve made that my toddler was willing to eat (and helped spin the greens dry! ), and Jeremy and I went back for seconds. 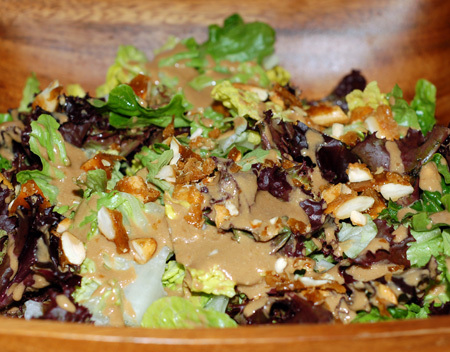 Since I’m always looking for ways to use my yogurt these days, this easy dressing will be right at home in the rotation. Combine one cup each of milk and cream in a saucepan with the sugar, honey, and orange zest. Heat until steaming, then add the chopped almonds. Cover and allow to steep for one hour, then strain out the almonds; add the remaining cup of cream and the extracts, stir well, and chill until ready to churn in your ice cream maker. Add the chopped gingered almonds just before the ice cream is ready to come out of the ice cream maker, or use them as a garnish for scoops afterward. 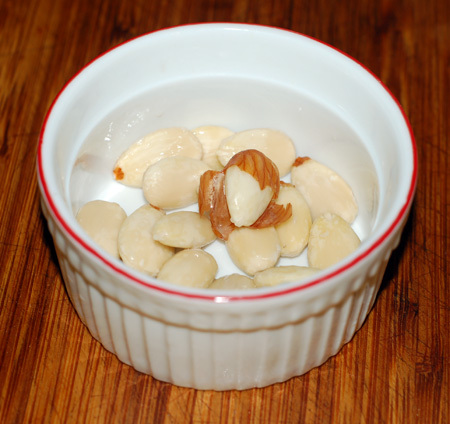 Blanch and peel the almonds: Dump them in boiling water for 60 seconds, then pour into a colander or sieve and rinse under cold water until cool to the touch; the skins should slip off easily (almost too easily… take care not to let them go shooting across the room!). Place the almonds, sugar, butter and ginger in a nonstick skillet over medium heat, stirring frequently, until the almonds are toasted and the sugar mixture has thickened and taken on a caramel color. Dump out onto a silpat to cool, sprinkle lightly with salt, then chop for inclusion in ice cream or salad (or leave whole for snacking! ).